The 2019 Speedbird Ladies race will be held on Wednesday 8th May with a start time of 19:00. Organised by British Airways Athletics Club and run under UKA rules with UKA Permit: 2019-37733. Held in the British Airways Parklands at Harmondsworth Moor. The course is a single 5km lap, it is traffic free and gently undulating. Please note this course is not suitable for wheelchair users or pushchairs. There is free parking nearby. There are no changing facilities - please come ready to run. There are medals and a memento to every finisher, and prizes for Open and Veteran runners and Team prizes with three to count. The 2018 Speedbird Ladies Race was held on Wednesday 9th May 2018. 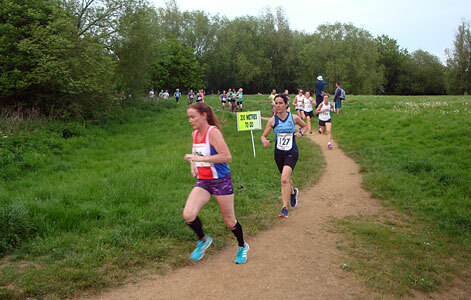 It was organised by British Airways Athletics Club and run under UKA rules with UKA Permit: 2018-35071 and held in the British Airways Parklands at Harmondsworth Moor. The course was a single 5km lap, traffic free and gently undulating. The attached photograph was taken 200m into the race. 60 finishers. Please report any inaccuracies.